Dimensions 1.25 by 4.50 by 7 in. For Dirk Gently, private detective, a simple search for a missing cat uncovers a bewildered ghost, a secret time traveller, and a devastating secret that threatens the future of humanity. Amazon.com description: Product Description: For Dirk Gently, private detective, a simple search for a missing cat uncovers a bewildered ghost, a secret time traveller, and a devastating secret that threatens the future of humanity. from Simon & Schuster (May 1, 1987); titled "Dirk Gently's Holistic Detective Agency"
from Gallery Books (October 7, 2014); titled "Dirk Gently's Holistic Detective Agency"
About: From Douglas Adams, the legendary author of one of the most beloved science fiction novels of all time, The Hitchhiker’s Guide to the Galaxy, comes a wildly inventive novel—in trade paperback for the first time—of ghosts, time travel, and one detective’s mission to save humanity from extinction. 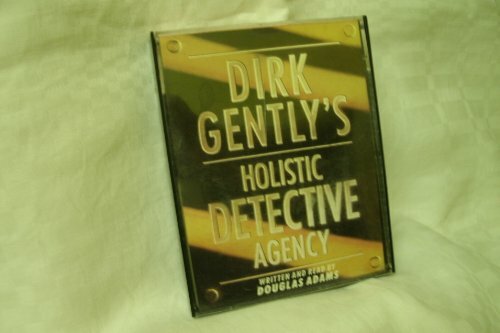 Reissue edition from Pocket Books (May 1, 1998); titled "Dirk Gently's Holistic Detective Agency"
About: There is a long tradition of Great Detectives, and Dirk Gently does not belong to it. Unabridged edition from New Millenium Audio (June 1, 2001); titled "Dirk Gently's Holistic Detective Agency"
About: What do a dead cat, a computer whiz-kid, an Electric Monk who believes the world is pink, quantum mechanics, a Chronologist over 200 years old, Samuel Taylor Coleridge (poet), and pizza have in common? Unabridged edition from Phoenix Books Inc (January 1, 2001); titled "Dirk Gently's Holistic Detective Agency"
Abridged edition from New Millenium Audio (February 1, 2002); titled "Dirk Gently's Holistic Detective Agency"
About: For Dirk Gently, private detective, a simple search for a missing cat uncovers a bewildered ghost, a secret time traveller, and a devastating secret that threatens the future of humanity. from Demco Media (May 1, 1988); titled "Dirk Gently's Holistic Detective Agency"
from Turtleback Books (June 1, 1991); titled "Dirk Gently's Holistic Detective Agency"